Growing up as a dancer in Florida myself, Amanda's studio (Focal Point) has always been an all-time favorite of mine. 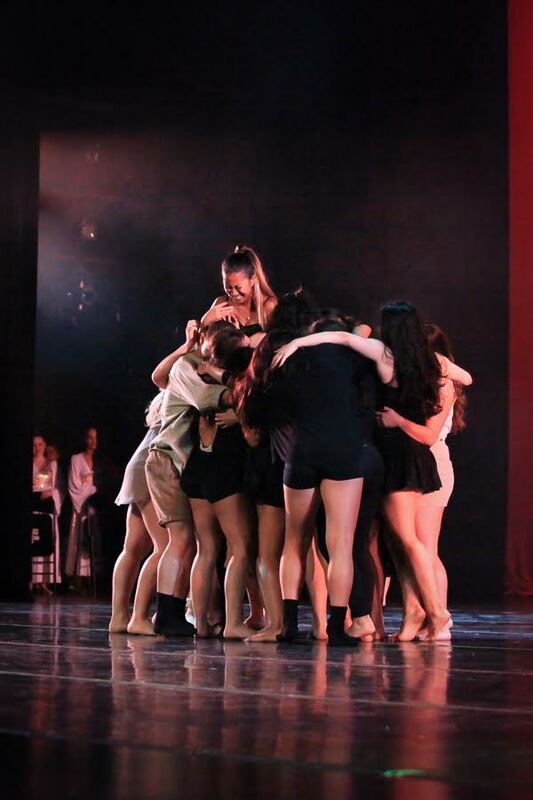 The FP dancers dominated every competition and convention in the state (and nation) and deserved every bit of it. Even just as a spectator, I always felt so honored to see them perform. Point blank: if you're a dancer, you've heard of Focal Point and you've heard of Amanda Tae. Her choreography is always a masterpiece, her drive and love for her students is undeniable, and the athleticism and dedication that her students display is so freaking inspiring. Can you tell I have a total girl crush? Thanks so much for being here, Amanda! Hometown: I was born in Fairfax, Virginia, but Miami is my home. Hustle(s): Director at Focal Point Dance Studios, President at Tae Talent Agency and Artistic Director at Mosaic Dance Project. My Grandma. She’s a beast. She maintained such grace while working in the Army, fighting tuberculosis, raising 4 children, and finding her way to America. Misusing “too” vs. “to,” or grammatically incorrect texts! Who would your Amazing Race partner be? My mom. She’s an intimidating mixture of Boss, Ninja, and Dragon with a hint of Sarcasm. Failure is not an option in her world. Most of my time is spent choreographing and running rehearsals at Focal Point Dance Studios. When Tae Talent (my talent agency) receives a casting (for a Flo Rida music video, for example) my assistant and I work to fill slots, get Miami’s most talented dancers booked, and then read through their contracts to ensure they’re treated and compensated fairly. Finally, my nonprofit company, Mosaic Dance Project, performs throughout Miami at venues ranging from community schools to the Sagamore Hotel on South Beach, to the Wynwood Art Walk raising awareness and engagement in the arts. Between performances, I’m working with our grant writer to secure funding and networking all over Miami for new performance opportunities. I make coffee and breakfast, pack lunch, answer emails, work on castings, fight with productions to pay talent for services rendered, write thank-you cards, work on the week’s schedule, try on costumes, tailor costumes, order costumes, work on the competition schedule, plan my upcoming wedding, find substitute teachers (the day of class), choreograph and teach class, go home and try to be a wife. I stick a shower in there somewhere. What is your dance background like? I started dance at the age of 3 to correct my pigeon toe issue, and ended up falling in love. I trained in ballet, tap, jazz, lyrical, contemporary, modern, musical theatre, hip hop, and commercial dance. I haven’t stopped since! When did you transition into choreography? When I was 16, I began taking over classes as a teacher at my studio. That forced me to choreograph, and from there I developed a love of creating. As I got older, choreography became more personal - another way to express myself when words weren't enough. I’ve found that a lot of people don’t like to hear or see the truth - and I’m a bad liar. This was my way of being completely honest with myself and the people around me. How early in your career did you know you wanted to open up your own studio? I never in my career wanted to open a studio. I did it for my students. They wanted a home, so we made one together. Do you feel that your higher education contributed to your success as an artist and business owner? Personally, I don’t believe my higher education directly contributes to my success per-se, but classes definitely helped me learn to write some fiery emails, and the knowledge and experiences I gained are priceless. My biggest inspiration always comes from my life experiences. I’m always trying to translate intangible thoughts, emotions, and situations into something tangible. In terms of other dancers/choreographers, I love everything from Batsheva to Paula Abdul. Did you ever consider opening a studio anywhere outside of Miami? Yes, I’d love to, but reliable help and dependable startup funding is hard to find! What do you think has contributed most to the growth and success of your studio? The dancers, and my refusal to settle or to give up. My passion for the art form demands the best from those I work with. What makes a “good dancer” to you? Someone who combines discipline, respect, time, and passion for the art form, their colleagues, their instructors, and the dance floor. What is your approach to being a dance teacher? Brutal honesty, ensuring the dancers are being true to themselves, and never settling. Being basic is so last season! Do you have any other community involvement? I recently spoke at the Leadership Miami: Sports, Arts, and Culture Session at Marlins Park. I teach regularly at Coral Reef High School as part of the Dade Association of Dance Educators Dance Workshop, as well as other community middle and high schools, and attend and judge community performances and competitions. What advice would you give to other dance teachers/studio owners? Trust your instinct and be patient. Everything comes out in the wash.
What are some of your favorite experiences and opportunities you've had in your career? One of the experiences that always stuck was a performance I did in an ancient coliseum somewhere in South America. The production value was nonexistent but I remember feeling an energy from my fellow performers and the audience that was indescribable - the floor vibrated underneath us and it wasn’t because of poor construction. I still get goosebumps thinking about it. I just remember feeling so small in front of this huge audience in the pitch black of night in a rural area. It was a sea light from of old school flip phones and lighters. I’ll never forget how despite the lack of money had by the production, venue or audience, the connection between the performers and the audience made the experience magical in a way money never could. In addition to choreographing and running the studio, do you wear other hats? When did you decide it was time to start delegating and growing your team? At the studio, I'm a babysitter, social media manager, graphic designer, producer, costume designer, stylist, talent agent, talent scout, grant writer, shoulder, ear, pseudo mom, “bus” driver, etc. LOL! Delegating has always been hard for me, but after the 3rd/4th year, it had to be done, and growing the team was inevitable. What is one of the biggest challenges you’ve faced in your work? How'd you overcome it? It has always been and continues to be finding a home for my FP family and students. The first and only studio I’ve ever worked for (before my own) began a legal battle when I left, which included my students. They of course lost on false pretenses, but the process was incredibly painful. Keeping my head up, heart open, and knowing that everything comes out in the wash was key. The belief that I’m making a difference in the lives of my students and dancers. Watching the people around me evolve. Dealing with parents who think they know how to do my job. What is your most favorite piece you’ve choreographed? What's your favorite piece someone else has choreographed? Echad Mi Yodea by Batsheva Dance Company. I had the opportunity to watch it live and started sobbing 3 minutes in. Who are your favorite dancers at the moment? My favorite dancers are the ones who come on days they don’t have class to rehearse or take extra class, and the ones who come an hour before class to stretch or review choreography. Waking up at 10am in a foreign country next to my husband with my health and a text from my assistant that all the email accounts are clear… and then eventually having kids. My work is my life. The balance comes because they’re one and the same LOL. What helps you wind down / how do you manage stress? Do you have any noteworthy (intense, funny, embarrassing, etc.) work-related moments? Once, my assistant was driving my car on a main road in Kendall, FL and the trunk flew open in the middle of the road. Thousands of dollars of bags, shoes, and clothes (not to mention documents like my passport) fell out and before he could do anything other drivers stopped to open the doors of their cars and grab things out of the road for themselves! Not a single thing that fell out of the trunk was recovered. No one was hurt and Lord knows I couldn’t do anything without him… so we found a way to work things out in the end. Luckily that’s the biggest fiasco he’s ever caused in our years together. I would love if people would be less concerned with connecting to the internet and be more concerned with connecting to each other, to their communities, and to the things that bring them alive. My art is my life and without that basic human element, none of it is possible. Career and/or life advice for other women? You are your business. No one is going to love or care for someone or something as much as your capacity to love and care for yourself and the things you are passionate about. Sleep when you’re dead… or under your desk. The job gets done, the show goes on, and failure is never an option. Make it work and make every moment count. Dancewear Solutions offers a large selection of the latest dance and gymnastics costumes, shoes, leotards, shorts, tights and accessories, etc. They carry most major dance brands (Balera, Bloch, Capezio, Danskin, Sansha, Urban Groove and more!) Check out their collection for up to an additional 70% off clearance items.